womenforfootball.com – Considering Jose Mourinho’s astonishing records in his previous teams, such as Chelsea, Inter and Porto, there were tremendous hype over his appointment at the held of Real Madrid. The titles he achieved at Porto for instance, had not been done by his predecessors in years. Same story for Chelsea and Inter Milan. At Porto and Inter Milan, mostly because of their previous dismal record in Europe and then a sudden turn-around in European Competition. The same story did not apply to Chelsea, as his future successors, most notably, Roberto Di Matteo, managed to take Chelsea FC to Finals of Champions League and win the prestigious trophy with the team, which Mourinho could not. Now lets focus on Mourinho’s tenure at Real Madrid. Ever since his appointment at Real Madrid, instant La Liga championship and Champions League trophy was expected by fans and even Real Madrid directors. After all, in 3 full seasons, Real Madrid’s Director, Perez, splashed more than 158 million Pound for bringing Mourinho’s favourite players; including Cristiano Ronaldo, Ozil, Khedira, Essien, Modric and Karim Benzema amongst the many. However as we look at the chart, all titles he managed to do achievein 3 seasons were 3 titles; 1 La Liga Championship, 1 Copa del Rey and 1 Supercopa. To put that in perspective, I compared Jose Mourinho’s 3 seasons, with his predecessor, Pellegrino, who was in charge for one season only. Then also I compared his managerial stats to Pep Guardiola, from 2010-2012(Although he was in charge since 2008, but just to be fair to Mourinho! 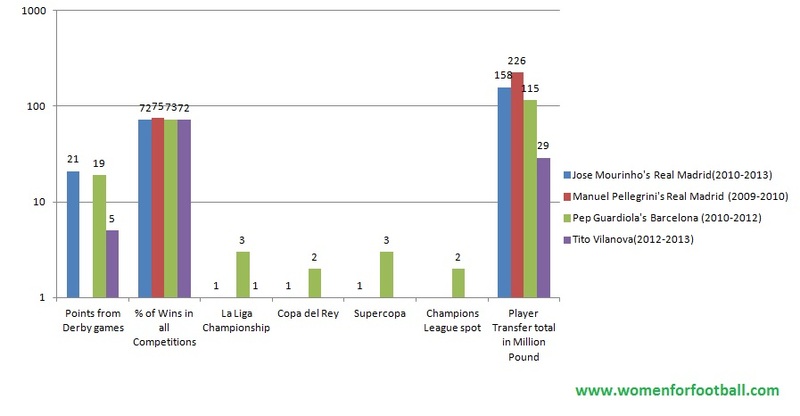 ), and also comparing Mourinho’s last season against Barcelona’s last coach, Tito Vilanova. As you can see, what Pep Guardiola achieved with Barcelona in 2 seasons that collided with Mourinho, is superior in all aspects, except number of points in El-Clasico games. Mourinho’s team accumulated 21 points in El-Clasico games against Barcelona in 3 seasons, while Pep Guardiola from 2010 until end of 2012, had accumulated 19 points. And Vilanoval record 5 points in one season. In all other sections, specially La Liga championship and Champions League, Pep Guardiola’s Barcelona during 2 seasons were superior to all titles achieved by Mourinho’s team in 3 seasons. Guardiola’s team achieved 2 consecutive UEFA Champions League trophies in 2 seasons, while the best Mourinho could achieve was Semifinal spots, although 3 consecutive Semifinal spots. Although to put that in Real Madrid club perspective, Mourinho’s predecessors had dismal records in Champions League in previous seasons. One could argue, Barcelona under Pep Guardiola had the best performing team of their history, but Jose Mourinho who argues is “Best of the best”, surely came short of proving it on the pitch when it mattered. Here are Raw data in table as a reference. So for Chelsea director, Roman Abramovich, who is ready to splash Millions, if not Billion on squad changes, he should know that Perez did that for 3 consecutive seasons, and it did not quite work against strongest competitor. And for Chelsea FC fans who cheerfully anticipate Mourinho’s debut game again, they could also remember that Di Matteo actually won Champions League with Chelsea, so Mourinho needs to do just that, if not better, to be called “the One” again. June 9, 2013 in Club football. Tags: Barcelona, Chelsea FC, Jose Mourinho, Mourinho, Pellegrini, Real Madrid, Vilanova.